NASA's LADEE spacecraft slipped into orbit around the moon Sunday, beginning a feverish four-month campaign to demonstrate a next-generation laser communications system and answer long-standing questions about the nature and origin of the tenuous lunar atmosphere. The modest Lunar Atmosphere and Dust Environment Explorer spacecraft, measuring about 7.7 feet tall and 4.7 feet in diameter, fired its liquid-fueled engine at 1057 GMT (6:57 a.m. EDT) for four minutes, allowing the moon's gravity to capture it into a high-altitude orbit over the equator. Controllers based at NASA's Ames Research Center in California - kept operating despite the partial shutdown of the federal government - oversaw the critical maneuver. NASA's public affairs personnel are furloughed by the budget impasse in Congress, but mission officials confirmed the orbit insertion maneuver occurred as planned. Radio ranging data will determine the orbit's exact parameters, but officials said LADEE's main engine fired for the expected duration, so the spacecraft should be in its planned orbit. Mission plans called for LADEE to enter a highly elliptical retrograde orbit taking the spacecraft around the moon approximately every 24 hours. Two major orbit adjust burns are planned Oct. 9 and Oct. 12 to lower the altitude of LADEE's orbit, ultimately reaching a near-circular orbit about 155 miles over the moon's equator. "The orbit around the moon is retrograde, meaning opposite the lunar rotation, and also around the equator," said Greg Delory, LADEE's deputy project scientist at Ames. "A lot of the lunar science missions have done a polar orbit, but because of the kind of science we're after, we very much want to be around the equator." Sunday's arrival at the moon came after a one-month transit from Earth following LADEE's launch from Wallops Island, Va., aboard a Minotaur 5 rocket. LADEE completed three loops around Earth over the past month, aiming to arrive in the vicinity of the moon Sunday for the make-or-break orbit insertion burn. 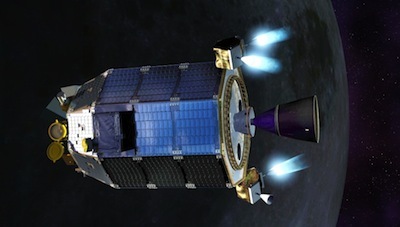 Once LADEE reaches the 155-mile-high orbit Oct. 12, ground teams will begin commissioning the probe's three science instruments, deploy aperture covers from the sensors, and activate the spacecraft's laser communications package for a 30-day demonstration of high-speed optical communications. The Lunar Laser Communications Demonstration aboard LADEE will link up with ground stations in New Mexico, California and the Canary Islands, exchanging data packets at speeds unattainable with radio communications systems. "Once the two systems are locked and acquired, then we can send tens of megabits of data per second from the Earth up to the moon, and similarly we can send hundreds of megabits per second from the moon on LADEE down to the Earth," said Don Cornwell, the laser communication demonstration mission manager from NASA's Goddard Space Flight Center in Greenbelt, Md. Built by MIT Lincoln Laboratory, the communications payload will help build confidence for future missions to use laser data links from deep space, including NASA's manned asteroid mission and future rovers on the surface of Mars. "NASA has a need for faster download speeds for data from space," Cornwell said. "We'd like to be able to send high-resolution images, movies in 3D even, from satellites that not only orbit the Earth but also from probes that will go to the moon and beyond." Another benefit of laser communications is it requires fewer components and smaller terminals, both on the ground and in space. "Light waves are shorter in wavelength than radio waves, so we can use smaller transmitters and receivers," Cornwell said. After LADEE's one-month commissioning and laser demo phase, controllers will put the probe in an orbit closer to the moon for a 100-day research mission exploring the dust environment just above the lunar surface and measuring the composition of the moon's ultra-thin atmosphere. The moon's atmosphere, or exosphere, is so thin its atoms never collide, according to Sarah Noble, LADEE's program scientist. "Part of this mission is about redefining our understanding of space," Delory said. "The moon is part of a unique class of objects. They are solid rocky bodies, but they don't have a thick atmosphere around them." Other solar system bodies with exospheres like the moon include Mercury and giant asteroids like Ceres and Vesta, the destinations for NASA's Dawn mission. "It's called a collisionless atmosphere, but it has many of the same behaviors as a typical atmosphere," Delory said. "There are winds in response to heat and light. There's a kind of lunar weather." LADEE's science instrumentation will study the dynamics of the lunar exosphere, measuring its response to sunlight, especially around the terminator where the night and day side of the moon meet. "We know from Apollo that there's a gas called argon-40," Delory said. "It's an isotope that probably comes from the interior of the moon. There's argon gas hanging around the moon, and when the moon rotates into night, the argon gets cold and it goes down to the surface, and then as it rotates again into sunlight, it comes leaping off the surface because of the heat. There is literally an argon wind over the terminator of the moon, if you can imagine. That is an example of a component of the lunar atmosphere." Mission scientists are requesting observations from amateur astronomers to identify lunar impacts. Knowledge of the location and timing of impacts could help researchers determine how the events disturb the moon's atmosphere. LADEE will look for signs of hydrated compounds, such as water and hydroxyl (OH), migrating from the moon's middle latitudes toward polar cold traps in permanent shadow, where scientists say ice can sit undisturbed for billions of years. And the mission's dust particle sensor will address a question lingering in the minds of scientists since the Apollo missions to the moon in the 1960s and 1970s. Astronauts saw an eery glow along the lunar horizon at sunrise and sunset, and experts hypothesize the colors were generated by the scattering of sunlight by dust particles mysteriously levitated tens of miles above the moon's surface. "We have fantastic images of glowing stuff above the horizion, and it was given the term lunar horizon glow," Delory said. "Scientists and engineers spent a lot of time trying to figure out what that was, and the most likely explanation is fairly sizable amounts of dust that are being levitated off the surface by some process we don't understand." LADEE will identify dust concentrations in the space just above the moon and help scientists understand the mechanisms driving the dust particles from the surface. The mission will conclude in early 2014 with an intentional crash into the moon after the spacecraft runs out of propellant.